Milton "M.R." or "Milt" Roy Good: entrepreneur and philanthropist, was born 20 June 1911 on a small farm in Waterloo Township, Waterloo County, Ontario, Canada to Henry Good (17 October 1877-14 May 1955) and Mary Martin Good (13 November 1883-6 May 1970). He was the third child and eldest son in a family of five daughters and three sons. On 5 September 1938 he married Verna Idell Snider (14 November 1911-28 July 1976). They had two sons, James (1941- ) and John (1946- ). After Verna's death from meningitis he married Eleanor Young High (9 May 1924-6 November 2001) on 4 June 1977. After Eleanor's death from multiple myeloma he married Margaret Culp Brubacher (11 February 1912-15 August 2015) on 2 June 2002. Milt died unexpectedly on 3 March 2008; he is buried in the Parkview Cemetery in Waterloo, Ontario. As a teenager, Milt Good worked on his father's farm as well as those of his neighbors. After completing elementary school he took a three-year commercial course at Kitchener-Waterloo Collegiate. He obtained a position at a small company in 1927, but before the end of the year accepted a position at the Waterloo branch of the Royal Bank of Canada as a junior messenger. He gradually rose in the ranks, and worked in a variety of the bank's branches in Ontario. He remained at the Royal Bank until 1948, when he left to become the office manager of H. Boehmer and. Co., a heating and building supply company. In time he became the owner of the firm, and expanded the business over the years by absorbing smaller companies. He sold the business to St. Lawrence Cement in 1973, and retired as president of the firm in 1976. At that time it was doing an annual business of $30,000,000 with over 400 employees. Good was an active member of the Erb Street Mennonite Church, where he was baptized on 26 December 1926. He began teaching Sunday school when he was 16 years of age, and was actively involved in leadership of the young peoples' literary society. When Noah M. Bearinger, then treasurer of the Mennonite Mission Board of Ontario (MMBO), resigned in March 1932 to return to the Old Order Mennonite Church, Milt Good was invited at the age of 20 to serve as treasurer. He continued in this role until May 1955. Prior to 1951 the Mennonite Conference of Ontario was not incorporated, so the separately-organized MMBO formally held all properties owned by the conference. In addition to various urban and rural mission-related properties, this included properties related to Braeside Home (later Fairview Mennonite Home), Rockway Mennonite School, and Chesley Lake Camp. In the 1940s Good served on a committee that created the Mennonite Benefit Association, an Ontario-based mutual aid organization that provided hospital/surgical assistance and burial aid. He became its first president in 1948 and served until 1953. 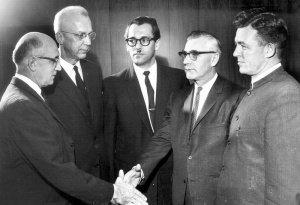 Because of his experience with Mennonite Benefit Association, in 1949 he helped to create the similar U.S.-based Mennonite Aid, Inc., a subsidiary of Mennonite Mutual Aid and served as its President from 1949-1953. He continued on its executive until 1955. He also served on the Mennonite Church's Committee on Economic and Social Relations from 1948-1955. Taken at time of Dedication Service for Conrad Grebel College, 25 October 1964. L-R: J. Winfield Fretz (President), Carl Kreider (Goshen College representative), Walter Klaassen (Faculty), Milton R. Good (Board chair), Newton Gingrich Newton Gingrich (Mennonite Conference of Ontario Moderator). Milt Good's business acumen made him a desired leader of several visionary inter-Mennonite projects. In 1955 the Good family became part of the independent Stirling Avenue Mennonite Church. As Stirling Avenue's representative, Milton Good became the first board chair of the emerging Conrad Grebel College in 1961. He participated in the 1963 hiring of its first president, J. Winfield Fretz, and in the construction of the first College building that opened in 1964. He remained board chair until 1970, and continued on its executive committee as treasurer or member-at-large until 1982. His elder son, James, also served on the College board of governors from 2000-2006, and chaired it for two years. His younger son, John, worked in the Conrad Grebel College Library from 1976-2011. In 2011 Conrad Grebel University College named its library the Milton Good Library. There were other inter-Mennonite projects as well. After the demise of the inter-Mennonite newspaper, Canadian Mennonite, in 1971, Good chaired the new Mennonite Publishing Service that published the Mennonite Reporter beginning in late 1971. He served in this capacity from 1971 to early 1973, and continued on the executive committee until early 1977. He also chaired the group that built Eastwood Mennonite Community Homes, a condominium tower for seniors built in the 1980s and sponsored by a group of Mennonite churches located near downtown Kitchener. Community service also engaged Milt Good. He served on the board of the Kitchener-Waterloo Symphony for many years, including two years as its chair. He also chaired the fundraising committee for the Centre in the Square arts and theater facility in downtown Kitchener that opened in 1980. In 1974, after selling his business, Milton and Verna Good established the Good Foundation, Inc. By 2010 over $3,400,000 has been distributed by the Foundation primarily to local projects and community groups, with a particular emphasis on Conrad Grebel University College. In his later years Milton Good was honored by the community as the guest of honor at the Kitchener Mayor's Dinner in 1995 and through election to the Waterloo County Hall of Fame in 1996. Milton Good was never completely comfortable with the money he had amassed, and he felt obligated to use it responsibly for the church and community. Several months before his death he said, "Money is only a means to an end, and what's the end? I am interested in Social Justice. The best service you can do for God is helping other people who need it." Part of this spirit came from his years as MMBO treasurer. "I had a good experience as Treasurer of the Mission Board. I had first hand knowledge of people who enjoyed giving. I had experienced that and it meant a lot to me…when I finally got a hold of some money I enjoyed it (giving) too." Good was an introverted man who said, "For me, I get closest to God if I'm up at Chesley Lake early in the morning as dawn is breaking. First you see the big birds… then the little birds start coming… the ripples…" Although he was self-conscious that he had no university education, he enjoyed reading theologically-diverse authors, and late in life said, "I'm a dedicated Christian but I'll tell you, you would be surprised at who you'll see in heaven." Milton R. Good was a modest man who lived generously. Funeral bulletin (8 March 2008). Good, Vera. Our family odyssey 1877-1997. Ontario: V. Good, 1997. Kennel, Ross. "Interview with Milt Good." The Community [Erb Street Mennonite Church](Fall 2008): 3-4. "Library named after visionary." Grebel Now 27, no. 3 (Spring 2011): 3. McMahon, Tamsin. "Good did best work behind the scenes." The Record (7 March 2008): B3. Mennonite Conference of Ontario. Calendar of appointments. (1932-1955). "Milton Roy Good." The Record (4 March 2008). Steiner, Sam. "Good, Milton Roy (1911-2008)." Global Anabaptist Mennonite Encyclopedia Online. August 2011. Web. 19 Apr 2019. http://gameo.org/index.php?title=Good,_Milton_Roy_(1911-2008)&oldid=134211. Steiner, Sam. (August 2011). Good, Milton Roy (1911-2008). Global Anabaptist Mennonite Encyclopedia Online. Retrieved 19 April 2019, from http://gameo.org/index.php?title=Good,_Milton_Roy_(1911-2008)&oldid=134211. This page was last modified on 2 June 2016, at 12:18.